It has been a while since I last blogged, but I've finally got round to writing some posts again as all my mock exams have been completed and are now out of the way. So hopefully for the next few weeks I can keep writing posts, that is until the actually exams start up in around May, I think it is (that's year 11 life for you). So to get back into things I thought I would do this post that I've seen many youtubers film, and a few bloggers write about, and that's to share with you what make-up I reach for on a daily basis. I have to say I don't always wear all the make-up I'm going to list, as sometimes I am just way too lazy before school, but when I do actually put some effort into my make-up these are the products that are my go too. First I'll start with the foundation, I use the 'Seventeen on the spot foundation'. This for me is one of the best foundations I have tried (though to be honest I haven't tried loads, if you recommend any comment below). It gives me the coverage I need but doesn't feel heavy and cakey. What also made me choose this one is the fact it has SPF 15 already in it, which is a must for me since I burn so easily. The concealer I use is a 'Rimmel Wake Me Up' and I have to say this is one of my all time favourite products. It covers up those blemishes that just wont go away, but also covers up those dark circles under the eyes and instead brightens up the area, which I find amazing and means I don't have to look like a zombie when walking round school. To keep those both in place I use the 'Rimmel Stay Matte Pressed Powder'. This I have been using since I first started using make-up. It mattifies your face - which is great for those with oily skin - and keeps that for pretty much a whole day. As my face doesn't look like it has much dimension to it I use the 'Collection Bronze Glow'. This one is this first bronzer I have tried out and I only got it because my friend gave it to me for Christmas. But I have to say for a first-timer at bronzing this has done the trick for me. On my eyes, I will use a colour out of the 'Little Black Beautybook' by elf. This palette has an array of warm toned colours that I find amazing to use everyday. In which all the colours have good pigmentation that last all day on top of a primer. Then if I have time and the patience I will line my eyes with one of the eyeliners I own - I mention them more in one of my earlier posts My Everyday Make-up. But always I will use the 'Rimmel Glam'eyes mascara' what ever make-up look I'm wearing. This mascara gives my lashes so much volume and length, I love it! Finally, we have the 'Nivea Lip Butter'. This product never really leaves my side, I always have it in my pockets at school and sat on my desk at home. It gives my lips so much moisture and makes them so soft, which has been amazing during the winter as my lips have been so dry. It also helps it smells amazing, which makes me want to use it that so much more. 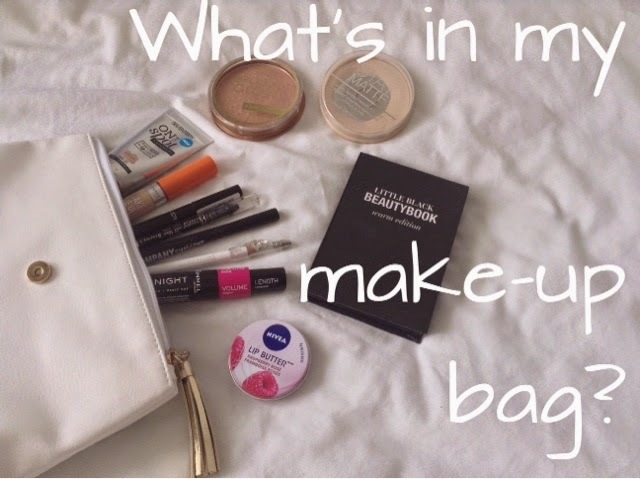 Well, that's all for what's in my make-up bag. If you have any make-up recommendations for products I should try out comment or send me a tweet at @Sophinna1.